Can I use Data to Beat Christie's Auction Estimates? Improvisation mit Pferden (Studie für Improvisation 20), painted in 1911, Oil on canvas, 71 x 99 cm. Christie's announced last week that they will be selling Wassily Kandinsky's Improvisation mit Pferden (Studie für Improvisation 20) or study for Improvisation 20 for an estimated $10m - $15m in the fall of 2017. The appraisers at Christie's likely have direct access to the painting, the documentation associated with it, control over the promotion leading up the auction, and 241 years of experience appraising and selling art. I have none of those things, but I do have a one-of-a-kind analytical art database. So I decided to build on the techniques I used to win 2nd place in the first fantasy art auction to see if I could create a more accurate appraisal than the experts at Christie's. The auction house appraises the work and gets with the seller to establish the lowest price they are willing to sell for, called the "reserve price," which is not made public. The public instead sees a range, with a "low estimate" and a "high estimate." Low estimates are commonly understood to be 25-30% higher than the reserve price. The "high estimate," is what the work would sell for under ideal circumstances for the auction house (a bidding war). The price announced when a buyer wins the auction is called the "hammer price." An auction house's commission and fees are then added to the hammer price, producing what is called a "premium price." One study showed that auction houses consistently lowball estimates by 20%. Why underestimate? Lower estimates mean lower reserves, which draws in more bidders, which drives up competition and sale prices, and produces more sales. This also gives sellers the pleasure of seeing the work sell for more than the estimate, increasing the chance they will do more business with the auction house in the future. If a work does not meet the reserve price, it is not sold, and is listed as "bought in." This is bad for the auction house (no commission) and bad for the seller (works are seen as unwanted or tarnished). Given the consequences, works are "bought in" more frequently than you might expect, around 20-30% of the time. Wassily Kandinsky, considered to be the father of abstract art, created 1,176 oil paintings in 54 years of painting (1890-1944). This works out to an average of 21 oil paintings a year, impressive when you consider he was also a prolific watercolor artist. Kandinsky painted Study for Improvisation 20 in 1911, just one year after his untitled watercolor, which most people believe is the first purely abstract painting in all of modern art. For this reason, works from this time period are particularly valuable. I looked at 198 Kandinsky paintings sold at auction between 1980 and 2017. The average sale price for these works was $3.2m when adjusted for inflation. I then narrowed the sample to include only paintings created between the breakthrough years of 1909 to 1913, and the average sale price jumped from $3.2m to $9.6m. 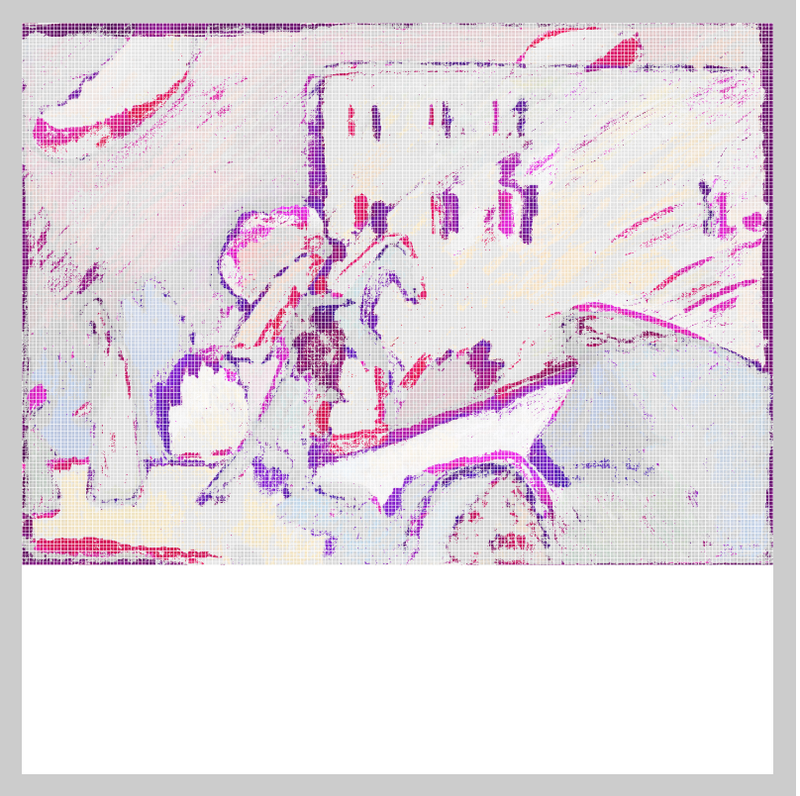 You can see rapid evolution in Kandinsky's work toward the abstract in the works below. 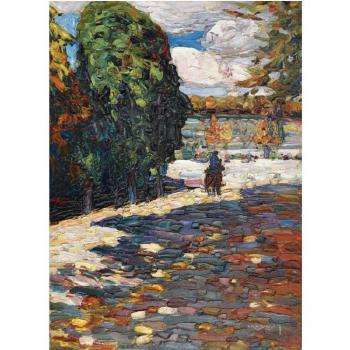 Park Von St Cloud - Mit Reiter (Park Of St Cloud - With Horseman), painted in 1906, oil on board, 33 x 24 cm. Strandszene, Painted in 1909, oil on board, 52.8 x 67 cm. Untitled Watercolor, painted in 1910, Watercolor and Indian ink and pencil on paper, 49.6 x 64.8 cm. Generally considered the first purely abstract painting. With paintings at auction, size often matters. At 71 x 99 cm and 0.70 square meters, Studie für Improvisation 20, is above the average size for a Kandinsky oil painting of 60.3 x 65 cm, 0.39 square meters. But Can a Study be Worth $10m-$15m? The first thing to note about Study for Improvisation 20 is that as the title suggests, it is a study for another painting. The actual Improvisation 20 is in the Pushkin State Museum of Fine Arts. Improvisation 20, painted in 1911, oil on canvas, 94.5 x 108 cm. So a study can't really be worth $10m-$15m, can it? Kandinsky rather commonly listed works as studies, with 39 of his 1,176 oil paintings having "study" in the title. It turns out the record for the price of a Kandinsky at auction from 2012 to late 2016 was $23m for, you guessed it, a study. 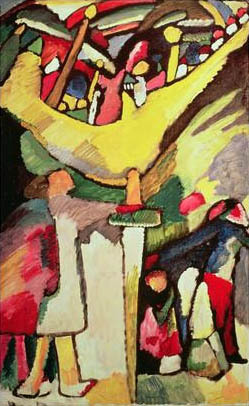 Study for Improvisation 8, painted in 1909, sold in 2012 at Christie's for $23m (currently the fourth-highest sale price for a Kandinsky at auction). The actual Improvisation 8 is nearly indistinguishable from the study. Using Resemble.js, a brilliant tool designed for in-browser image comparison by James Cryer, I discovered the two works have a 64% similarity rating. You can see the areas where the study most differs from the final composition below (darker colors = greater difference). Studie für improvisation 8, painted in 1909 in Murnau, oil on cardboard laid down on canvas, 98 x 70 cm. Improvisation 8, painted in 1909 , oil on canvas, 125 x 73 cm. The second image is 35.59% different compared to the first. Another example of a Kandinsky study with a high sale price at auction is his 1909 Study On Improvisation 3 which sold for $21m premium in 2013 (currently the fifth-highest sale price for a Kandinsky at auction). The similarity between the study and final composition is even stronger for these two works with a score of 90%. Study On Improvisation 3, painted in 1909, oil on Cardboard, 44 x 62 cm. Improvisation 3, painted in 1909, oil on Canvas, 94 x 130 cm. The second image is 9.91% different compared to the first. Now let's run the same test on Study for Improvisation 20 and Improvisation 20. The similarity score reflects what I think most of us already see with our naked eye; there is a much larger gap between the study and the final work in this comparison. This certainly could suggest Kandinsky felt there was more work to do before finalizing the composition. The second image is 43.09% different compared to the first. Kandinsky's record has been broken three times in less than a year, starting with the sale of Rigide et courbé, painted in 1935, at $23.3m in November, 2016. The record was then twice broken in the same night with Murnau - Landscape With Green House selling for a $26.5m and Painting With White Lines selling for a $41.8m in June, 2017. The record-breaking prices suggest a hot market, but no market is perfect. Auction houses frequently fail to find a buyer for paintings; when this happens they list them as "bought in". I found 20 of the 66 Kandinsky oil paintings offered at auction since 2010 were listed as "bought in" (not sold). Rigide Et Courbé, painted in 1935, oil and sand on canvas, 114 x 162.4 cm. Murnau - Landschaft Mit Grünem Haus (Murnau - Landscape With Green House), painted in 1909, oil on board, 70 x 96 cm. Bild Mit Weissen Linien (Painting With White Lines), painted in 1913, 119.5 x 110 cm. To my eyes, Study for Improvisation 20 does not look very much like the three record-breaking works above. Stylistically it sits somewhere between Painting With White Lines and the Study On Improvisation 3 we looked at earlier, but neither is a very strong comp. Herbstlandschaft (Autumn Landscape), painted in 1911, oil on canvas, 71.50 x 99.30 cm. I found Herbstlandschaft (Autumn Landscape) which sold for $9.5m premium 2014 to be the strongest comp. Both works were painted in 1911, are the same size, and use the same materials. The color palette, level of detail, and handling of paint are also similar across both works. My only problem with the comp is that nothing in Autumn Landscape resembles the almost pencil-like pictographic marks in the upper left of Study for Improvisation 20. I had a hard time finding similar markings in any of the works in Kandinsky's catalogue raisonne of oil paintings. Subjectively, something about those marks makes the painting feel less resolved than Autumn Landscape . Objectively, the lower similarity score would suggest that Kandinsky, too, found the composition of the Study for Improvisation 20 to be rather unresolved. Kandinsky made a lot of paintings (1,176 oil paintings) and most were abstract. He is credited for making the first abstract painting, Untitled Watercolor from 1910. Study for Improvisation 20 was created within a year of Kandinsky's first pure abstraction. Works from 1909 to 1913 average a sale price 3x higher than works produced in other years. Although the work is a study, Kandinsky studies have set records for his work at auction. The record for a Kandinsky at auction has been broken three times in the last year. In my sample, 20 out of the 66 (30%) of Kandinsky oil paintings offered at auction dating back 2010 were "bought in" (not sold). Study for Improvisation 20 scored a lower similarity score to its corresponding Improvisation than the other works we examined. There are some pictographic markings included in Study for Improvisation 20 that Kandinsky decided not to include the final version Improvisation 20. I looked for similar pictographic marks in all other works in the catalogue raisonne and nothing really came up. Despite a tendency for auction houses to lowball estimates, I am going even lower than Christie's on my estimate. If you average out the low and high estimates, I am valuing Study for Improvisation 20 at $9.5m; Christie's estimates $12.5m. With the upward momentum in the Kandinsky market, someone could certainly spend $12.5m or more for Study for Improvisation 20. But for my money, Herbstlandschaft (Autumn Landscape), our best comp, is the better painting between the two and recently sold for $9.5m premium in 2014. We won't know until the fall what Study for Improvisation 20 will sell for, and by then the experts may have me convinced me that its pictographic markings refer to the cave paintings of Altamira and set the course for Paul Klee and Keith Haring. Such is the beautifully subjective nature of art - despite all my best efforts to quantify it.